The Agazarian AGZWG22 22 in. wind gong with mallet — also known as a Feng Gong — is individually crafted by hand in the centuries-old tradition from the Hubei Province of China. 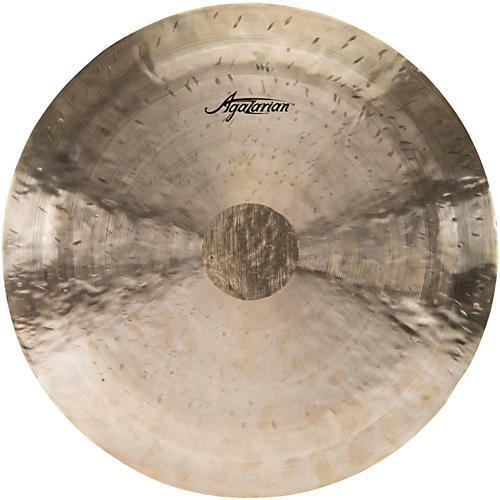 The almost flat design of this gong takes its shape through hand hammer and lathing, and when played, offers vibration, which spreads out exceptionally wide with a long sustain. The distinguishing smooth sound is mostly low-pitched, yet can open up nicely with a wash of overtones when played more aggressively. Offering a shimmering sound for traditional ceremony, this gong can also complement a variety of other musical styles. Also try playing it as you would a ride cymbal with a traditional drumstick and you will get a great deep, dark trashy ride sound. Gong mallet included. Add this affordable gong to your percussion setup.